A combination of two approaches to numerically solving second-order ODEs with a small parameter and singularities, such as interior and boundary layers, is considered, namely, compact high-order approximation schemes and explicit generation of layer resolving grids. The generation of layer resolving grids, which is based on estimates of solution derivatives and formulations of coordinate transformations eliminating the solution singularities, is a generalization of a method for a first-order scheme developed earlier. 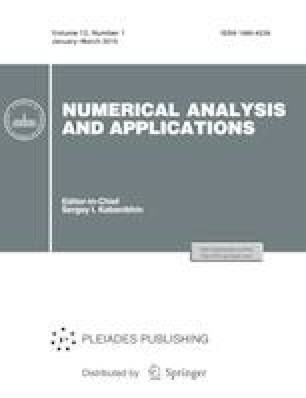 This paper presents formulas of the coordinate transformations and numerical experiments for first-, second-, and third-order schemes on uniform and layer resolving grids for equations with boundary, interior, exponential, and power layers of various scales. Numerical experiments confirm the uniform convergence of the numerical solutions performed with the compact high-order schemes on the layer resolving grids. By using transfinite interpolation or numerical solutions to the Beltrami and diffusion equations in a control metric based on coordinate transformations eliminating the solution singularities, this technology can be generalized to the solution of multi-dimensional equations with boundary and interior layers. Russian Text © V.D. Liseikin, V.I. Paasonen, 2019, published in Sibirskii Zhurnal Vychislitel’noi Matematiki, 2019, Vol. 22, No. 1, pp. 41–56.